In February 1943 the US Army Small Ships was experiencing a shortage of seaman for their vessels, this was brought about by a number of factors , loss of vessels and crews by enemy action , loss of vessels by grounding on uncharted reefs , the first lot of employees were due to be released as their contract had expired and they did not want to re-engage , crew members who were hospitalised through sickness or accidents or enemy action and also those killed as a result of enemy action . At this stage a Mr Arthur E Morgan from the Volunteer Coastal Patrol had applied to join the U S Army Small Ships , Mr Morgan had experience at training men & boys for service in the Volunteer Coastal Patrol so he was given the task of writing a syllabus for the training of apprentice seaman and to allocate the time needed for this training , and to become the Chief Instructor of the proposed training school . Mr Morgan calculated that there would have to be three courses of four week duration to teach 150 Apprentices the minimum requirements for ordinary seaman standard , elementary seamanship & practical small boat handling , navigation , aids to Navigation , Compass , Soundings , Signalling to include Morse Code , Light & Key, Semaphore , the International code in flags , Gunnery firing & maintenance of 30 and 50 calibre guns, rules of the road and first aid . Each course to have a minimum of 50 Students . Mr Morgan was appointed Chief Instructor of the Apprentice Seaman School of the Small Ship Branch effective of the 1st April 1943 at a salary of 750 pounds per annum and he appointed three retired Captains to be Course Instructors , two US Army gunners were made available for Instruction of the students in Gunnery & Gun maintenance , all firing to be from the SS Dover at sea. . The Australian Government of the day authorised the US Army to Hire 15-17 year old boys to be students at the Apprentice Seaman Course , they were Hired at a salary of two pounds per week , subject to passing a physical examination , the times at the school were Monday to Saturday from 8am to 5.30 , pm place of training was number 10 Wharf Walsh Bay , practical seamanship and gunnery training was on board the SS Dover an ex Tasmanian river boat . Mr Morgan made his own vessel available for instruction on small boat handling . Week 1 Course 1 , commenced on the 26th April 1943 with 49 students attending the Chief Instructor was Arthur E Morgan with Captains , May , McCulloch and Wood as Class Instructors , at the end of week 1 one member requested permission to resign and three others failed to attend. The students had their first day at sea on the Saturday and most of the students found that going to sea could be an unsettling business and all paid a tribute , so the skipper brought the ship into North Harbour for lunch , which was well received the Instructors Captains May , McCulloch & Wood proved to be thoroughly competent instructors under the most adverse conditions . The locale for the school was No 10 Walsh Bay , wharf & storage area ,which left much to be desired , classes were held in most part in exposed and unsheltered positions , and there was too much distraction and noise for satisfactory results. Week 2 of Course 1, there were two resignations and two joined the course so the number attending was 49 , the physical condition of the students left much to be desired , so twenty minutes of physical training was programmed for each day of this course and all future courses prior to the commencement of the first class each day. The students had three days at sea on the S S Dover and were becoming used to the motion of the vessel , all men had tricks at the wheel , trimmed bunkers and clean ship. The midday meal was consistently good , Mr Morgan was of the opinion that it was the only substantial meal that the students have all day. Week 3 of Course 1, the total number of students attending was 48 as 1 student had resigned , the course had made four trips to sea by this date and all handled the trips well , the course also attended classes on the wharf at 10 Walsh Bay and made up mooring lines out of two coils of rope the work was of a high standard. The standard of the student discipline remained excellent and the procedure of instruction and physical training remained unaltered. Mr Morgan complained of the conditions at Walsh Bay ,noise and movement are a continual distraction for the students in class. He also requested that when permanent quarters are made available some provision be made for individual lockers to be available for the students to use for their personal effects and issued gear to be stored. Week 4 of Course 1 , brought to an end of their training over 24 days of which six days were spent at sea , the school only had 1 day of gunnery training as no gun was available on other days , the rest of the syllabus was covered and tests showed that the students had assimilated the subject taught . There were a few students who were unable to answer written tests owing to there lack of education so they were examined verbally . 46 students completed the course and all were reassigned some went to New Guinea by air others by sea. Week 1 of Course 2 , commenced on the 24th May 1943 the number of students in attendance was 50,at the end of week 1 the number on the roll as at the 30th May was 57 . The Course went to sea on the Dover on 26th May sea was rough the students were sea sick but attended the mid day meal . As directed classes were held on the Sunday , only 39 men were present 10 students who were attending medical exams on Saturday were unaware of the Sunday training . Week 2 Course 2, there were 47 in attendance ,5 students were rejected medically unfit , 4 had resigned 1 was ill 1 student was too dull to follow the course , but otherwise thought to be desirable after speaking with Lt Crone he was assigned to a vessel. The students have learnt the rudiments of marching and squad drill they are now doing half an hour of physical training prior to commencement of lessons daily the students went to sea two days for gunnery and seamanship training . Week 3 Course 2 , total number in attendance was 46 two men were sick with a doctors certificate for their absence , two gunners were in attendance and all went to sea on the SS Dover for two days of gunnery training , all Instructors are pleased with the course standard . Week 4 Course 2 , twenty five days were spent in training of which seven days were spent at sea for seamanship and gunnery training ,the course finished with 45 students who were considered proficient .Those who qualified were sent to new Guinea for assignment to vessels. On two occasions during the week classes were suspended as on one side of the wharf a vessel was discharging oil drums and on the other side a vessel was chipping rust making teaching impossible . The whole of the theory side was covered but no instruction in small boat handling was given as no small boats were available . Week 1 Course 3 , The course commenced on the 23rd June with 67 students the number increased to 83 by the 24th and reduced to 79 later , 1 man carried over from the previous course owing to illness , the behaviour of the students leaves nothing to be desired , probably due to better selection . The students were divided into four classes and the procedure of drill and physical training is unaltered from previous schools , the students had two days at sea for seamanship and gunnery training . Week 2 Course 3 , number in attendance is 76 . The students without exception are very keen and for the most part show good progress . Class hours have been extended slightly to cover the extra time required to personally attend to the increased number of students. The students had a further two days at sea for gunnery and seamanship training , in gunnery they all displayed an excellent sense of direction , but found the gun mounts heavy too handle, none were gun shy . As we had a quiet sea , shore classes were carried out on board the Dover . Week 3 Course 3 , number in attendance is 75 ,The increased size of the classes has been managed by increasing class hours and continuing the usual shore classes on board the Dover whilst at sea, all students have now made 7 days at sea , the usual gunnery training on the Dover was cancelled this week and all students participated in gun servicing under the command of the two gunners as requested , the gunners will return next week for further training in gun servicing by the students . Week 4 Course 3 , Number of Students in attendance 74 ,they have satisfactorily completed the theory and practical course syllabus twenty four days were devoted to the course seven days of which were spent at sea , the whole of the syllabus has been completed with the exception of the power boat handling. As instructed by Lt Slade all men are to remain at the school until for the following week . A training syllabus has been planned for the students to receive further training in seamanship, gunnery small boat handling next week ,students are to assist the engineer and the fireman on board the Dover also. Week 5 Course 3 ,number in attendance was 72, two students were discharged prior to the completion of the course .This last Course was completed on Saturday the 23rd July 1943 . The last week of the course was devoted entirely to practical work under actual working conditions . Small groups of students spent an entire day at steering and ship keeping on the SS Dover , Two Gunners were present for the whole of the week and they reported that all the students have had considerable practice in gun servicing and aiming & firing . The students rowed many miles in the dinghy’s , made up lines and fenders and had further practice in first aid and morse and semaphore signalling. At the closure of the School all four Instructors were presented with a small gift by the students representative , acting on behalf of the Students . The 72 students who qualified were assigned to vessels or sent to New Guinea by air or sea . The Chief Instructor A E Morgan on behalf of Captains Moore , Wood & McCulloch took the opportunity to record their keen appreciation of the advice and assistance extended to them by Major Elder and his staff in particular Lt Crone and Lt Slade who were unremitting in their efforts to ensure the success of the School . Mr Morgan placed on record their appreciation of the support of the Master and crew of the S S Dover who have at all times been most co-operative and helpful . The boys on completion of their course and the satisfactorily completion of their final examination , and when assigned to a vessel , were offered the position of apprentice seaman at a salary of 26 pounds per month , after 6 months they then progressed to ordinary seaman at a salary of 33 pounds 3 shillings and 5 pence per month . They also had to sign an authority for deductions to be paid to the Australian Taxation Office which was deducted from their monthly salary . No other Allied Government encouraged 15 year old boys to attend a 4 week training school and at the completion of the school and the passing of the required written and practical examination sent them by the fastest means of transportation into a combat area . Chief Instructor A E Morgan , at the completion of the School was appointed Master of the O L 1 , the first of many twin screw , 250 ton ocean going lighters , that were built in Australia and used by the Small Ships and the RAN and the Australian Water Transport ,for medical evacuation and cargo , fuel and water carrying. Captain Morgan served in this capacity from the 1st August 1943 until 5th July 1944 , the expiration of his contract with the US Army Small Ships . 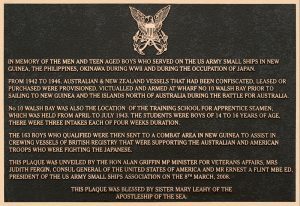 The success of this School was clearly demonstrated by the US Army Small Ships Section hiring of 163 , 15-16 year old boys who completed the School and were hired by the US Army Small Ships (with the Australian Government Manpower approval) & served Australian & American forces in New Guinea in WW11 . Their service made up the critical shortfall of crews for the Small Ships vessels in New Guinea and allowed the recapture of other towns and villages in New Guinea in 1943 -1944 in what came to be known as the “Battle of the Beaches”. The above record of instruction & attendance was recorded by Mr A E Morgan Chief Instructor of the School , and are copied from his original documents. President , U S Army Small Ships Veterans Association . *The visit by Colonel Thomas G. Plant , US Army , to the Joint Chiefs of Staff in Washington USA , to explain the critical shortage of personnel is recorded in “ The Transportation Corps Operations Overseas ” Bykofsky & Larson , Center of Military History , United States Army . 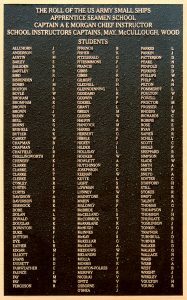 The plaques below were unveiled at Walsh Bay, Sydney on 8th March 2008 in Honour of the brave Australian boys who attended the Apprentice Seaman School.